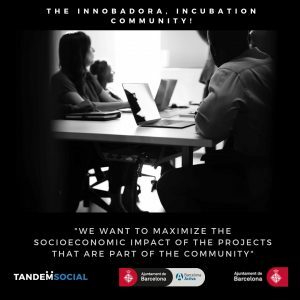 Tandem Social | The InnoBadora, incubation community: coming soon! The InnoBadora, incubation community: coming soon! 02 Nov The InnoBadora, incubation community: coming soon! InnoBadora, the new incubation community of Barcelona Activa, will open its doors in November with the collaboration of Tandem Social. The objective of the space is to provide a ‘home’ for the social and solidarity economy projects of the city of Barcelona. In order to maximize the socioeconomic impact of the projects that are part of the community they will be supported with mentoring, training and the facilitation of collaborative work within and beyond the incubation community. The projects that form part of the InnoBadora will have all the facilities and services of a co-working space, shared with a diverse community of entrepreneurs with common values. The Tandem Social team will facilitate the InnoBadora community, encouraging collaborative work and knowledge transfer in order to grow the participating projects, thus strengthening the transformative economies ecosystem of Barcelona. For more information, visit the following website.